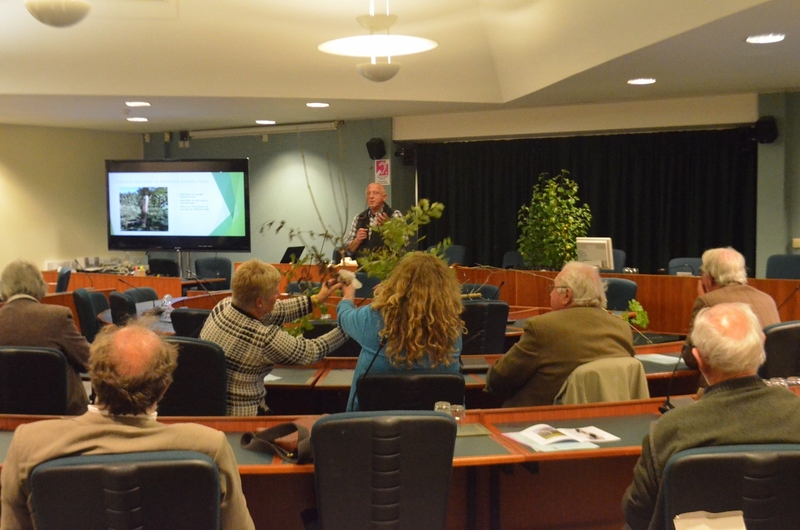 On Thursday 24th September, members and guests gathered at the Council Chamber of Cotswold District Council for the AGM event. Tea, coffee and cake were available on arrival, prior to the formal AGM. Our Chairman, Mike Hartnell, presented his report on the activities undertaken in the last year. The group finances were presented to the meeting. Disappointingly, no volunteers had come forward to join the committee and so the committee and officer positions were re-elected. With the formal business concluded we settled down to enjoy an entertaining and informative evening. Mike Hartnell took the floor first to tell us about his work managing woodland estates in the Cotswolds. Illustrated by slides, Mike also had a number of “props”, including medals and timber products, amongst them a longbow and a hurley. For those not familiar with the latter, it is the stick used in the Irish sport of hurling. Made from ash wood and used in great numbers, the current threats to ash are of great concern to the sport. This led us naturally on to Keith Mills who gave us an update on pests and diseases. Keith had spent an earlier part of the day sourcing samples, especially of ash, to help us identify the normal and the diseased when we are out in the field. Seeing real examples will surely give us a better chance of assessing tree health than simply viewing pictures.